Noting that 2018 will mark the centenary of the birth of the late Nelson Mandela, the UN General Assembly has decided to convene a high-level plenary meeting to be known as the Nelson Mandela Peace Summit on 24 September 2018 at UN Headquarters in New York, in accordance with General Assembly resolution 72/243. 3) stakeholders to attend the September Nelson Mandela Peace Summit as observers. Organizations that are not in consultative status with UN ECOSOC will be circulated to UN Member States for review on a non-objection basis. 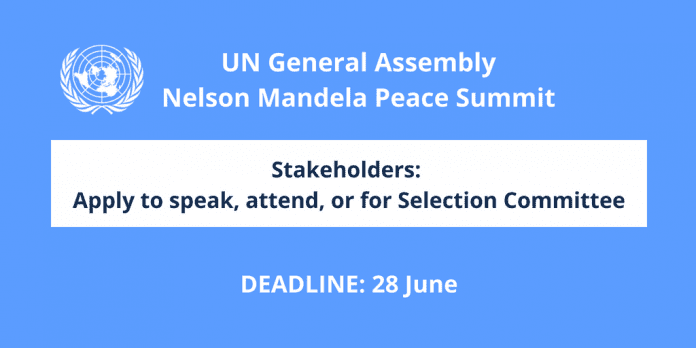 > Travel funding is NOT available from the UN to support the participation of stakeholder observers in the Nelson Mandela Peace Summit, or the meeting convened by the co-facilitators during the preparatory process. • has a visa for travel to New York, or is able to obtain one for travel to New York without assistance from the UN. Please check with the US Embassy or Consulate in the candidate’s country or place of residence. UN-NGLS will facilitate a stakeholder Selection Committee for the evaluation and short-listing of the candidates for the speaking role to be presented to OPGA for their consideration. The Committee will ensure regional and gender balance, and diversity of constituency and expertise in the overall set of candidates. The President of the General Assembly will make the final selection of the speaker for this event.